LESS THAN 2,500 CFS- Low. This is the range of flows that the river is in more often than not. 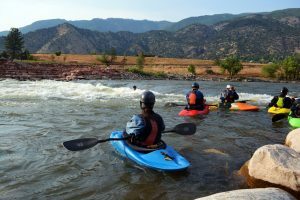 From July through April the Colorado below Glenwood likes to hover between 1,800 to 2,500 cfs, never really getting lower than about 1,300 cfs. The boat chute wave on river right is small but nicely formed, good for carving blunts, endless flatspins, and cartwheels with good technique. The main feature is steep and forceful but not overly retentive. Big loops possible, but tends to flush easier then expected at the corners. Two concrete blocks in the center-right are exposed. 5,000-10,000 CFS- Medium/high. The boat chute wave continues to widen and hold its ideal shape though it is now taller and faster; great for kayaks and surfboards. The main feature starts behaving more like a wave, especially as the level draws closer to 10,000 cfs. The river is moving faster but the hydraulic grows less sticky, making the feature more intermediate-friendly. Eddy access possible until about 6,000 cfs, above which each ride requires a hike. Center-right is unclean and still not consistently breaking. 10,000- 15,000 CFS- High. This is the range where the park really starts to shine. A typical runoff peak (usually late May to mid June) often lands in this window. At high water, the park forms one of better manmade big surf waves in the state and possibly the country. The river left side forms a wide and ideally shaped wave with a good pile. All wave tricks are possible though the river lacks the speed necessary to accommodate the big bounces seen on rivers like the Ottawa. Each ride is a hike, though if you are quick back to shore after flushing the hike is short and not strenuous. The less fortunate who get washed too far passed the Midland Bridge will be forced to do the long hike and cross Midland Ave (hopefully not during rush hour) to get back. The boat chute washes out at these levels but the two blocks center–right begin to form a large foam pile with a nice shoulder. This new feature gets better and better as the water rises, and we’ve yet to see a level when it washes out. Though you can catch this center-right feature from the river right eddy, unless there is a rope tow set-up to pull you up the swift water underneath the bridge, you will likely be doing a considerable amount of hiking. 15,000-20,000 CFS- Very High. Although this flow range is often rare, the wave in the park (now merged into one wide, dynamic feature) is amazing. The extra speed of the river gives aerial tricks the bounce they deserve and long rides are still possible. The center-right portion of the wave (Big Ugly) starts to really shine though is intimidating for the less-experienced paddler. The river left portion narrows considerably but becomes bouncier and more dynamic. 15,000 cfs seems to be the “dead-zone” level when the wave is hardest to stay on, but as the river approaches 18,000 cfs and higher, the wave starts to break more consistently again. Over 20,000 CFS- Epic. Having over 20,000 cfs in the river below the confluence of the Roaring Fork has become a very rare event. Unless the current trend of drier winters changes, these epic levels might occur about once every ten years. Though the Colorado is expected to potentially reach these levels in 2008, we have yet to see them and therefore can only guess at how the wave might react. One thing that can be certain is that the river will likely have a high concentration of logs and other debris at these near-flood stage conditions, and surfers and paddlers should always be wary of encounters with such logs. Spectators on shore will usually yell warnings to paddlers on the wave who might be too preoccupied with their ride to notice the impending peril of approaching deadfall.